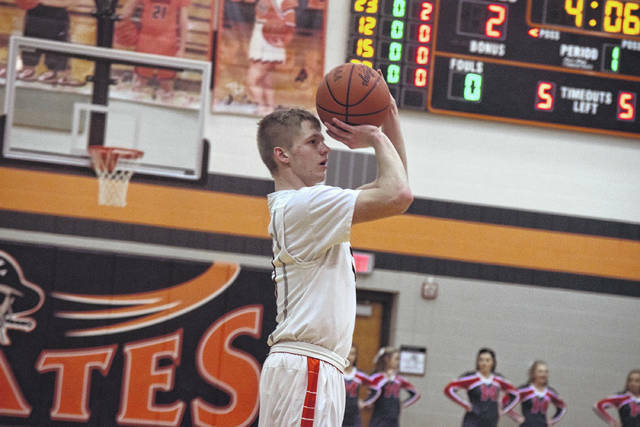 Wheelersburg’s Cole Lowery scored 21 points for the Pirates as Steven Ater’s club knocked off No. 7-ranked Oak Hill, 50-28, on Tuesday evening in Wheelersburg. The Pirates held Oak Hill to just six points in the first, three points in the second, and five points in the third quarter en route to the blowout victory. WHEELERSBURG — From a 22-point loss to a 22-point win — against the No. 7-ranked unit in the Associated Press Division III realm, and a conference rival that had long since been tabbed as the No. 1 overall seed in the Division III Southeast District Brackets well before the season began. Well, there certainly aren’t many things in the world of sports that are much sweeter than such a victory. After dropping a 62-40 decision to Oak Hill back on Jan. 19, the Wheelersburg Pirates’ boys basketball program proceeded to erase any memory of that contest in the eyes of their fanbase — while impressing many others around the Southeast District in the process — as the Pirates put on a defensive clinic with its 50-28 blasting of the Oaks on Tuesday evening in Wheelersburg to turn the SOC II race into a very interesting one, indeed. For Steven Ater, the veteran head coach, who called the effort “fantastic” from his players, was proud of how the Pirates stood up to the task of matching Oak Hill’s physicality with its own physical play. Over the first quarter of action, Wheelersburg started fast as the Pirates not only scored the contest’s first five points behind baskets from Mack Dyer and Tanner Holden, but held Oak Hill scoreless throughout the first half of the quarter. While Oak Hill ultimately responded with six straight points to take a 6-5 first-quarter advantage, Wheelersburg’s second-quarter output proved that the Pirates, not the elder and more experienced Oaks, had the momentum. After a quarter-opening field goal by Oak Hill, Wheelersburg proceeded to hold the Oaks to a single free throw over the final 75 percent of the frame as the Pirates held Oak Hill — complete with Brett Long back from injury in addition to Landon Carroll, Nolan Carroll, Mason Darby, and Mitchell Hale — to just three second-quarter points en route to taking a 14-9 halftime advantage. As the entire unit began to warm up from the field, it only helped Cole Lowery, who continued his tremendous play with an exceptional performance on Tuesday evening. After not scoring in the opening quarter of action, Lowery caught fire in the second quarter of playing by knocking down a pair of three-pointers and adding a pair of shots from inside the line on top of it to spearhead a massive 14-1 Wheelersburg spurt with his 10 second-quarter points. The Pirates, who obtained a 19-9 halftime lead, wouldn’t lead by any less than seven points the rest of the way as Lowery, who added 11 points in the second half of action, finished with 21 points — including three huge three-pointers and four critical free throws down the stretch. Tanner Holden, who proved to be a monster to handle on the glass again, notched seven of his 15 points in the first half as Wheelersburg took control. As Lowery continued to gather up momentum with his shooting — canning a two-point shot and his final trey of the evening to start yet another Wheelersburg run — the senior got help from his fellow teammates in the form of Dyer and Trent Salyers. A big offensive rebound by the former extended one offensive possession, and a trey by the latter capped off another as the Pirates went on a quarter-ending 8-2 spurt that was ultimately extended to a 13-2 mark thanks to additional buckets from Lowery and Holden. As the fourth-quarter began, Oak Hill, who began to employ a press defense to try to get back into the mix, ultimately saw its plans backfire as Lowery ultimately hit each of his four critical free throws in the quarter to keep the Pirates well in control, while adding yet another two-point basket to boot. Holden then capped the game off with two exclamation point-esque dunks to give Wheelersburg the 22-point victory. With the victory, Wheelersburg improved its overall record to 14-3 while moving to 10-2 overall in the SOC II. The Pirates’ victory over the Oaks dropped Oak Hill to 16-2 overall and 10-1 in SOC II action, and with South Webster (Friday), along with an improving Northwest squad (next Friday), still on the schedule, the remaining regular season affairs are far from a cakewalk for Oak Hill. Wheelersburg’s away bout with Adena was cancelled due to weather and will not be made up. A Friday bout at West is on the card for the Pirates.